In 1949, Elizabeth Taylor was a rising ingenue who made $1,000 a day. In her youth and talent Hollywood saw great potential, positioning her as the leading lady of a group of up-and-comers (including Montgomery Clift and Kirk Douglas) that studios hoped would fill the glamorous void left by its aging stars. What follows is an excerpt from the August 29, 1949 issue of Time Magazine; the piece discusses the challenges facing Hollywood and focuses on Taylor as somewhat of a savior for the industry. 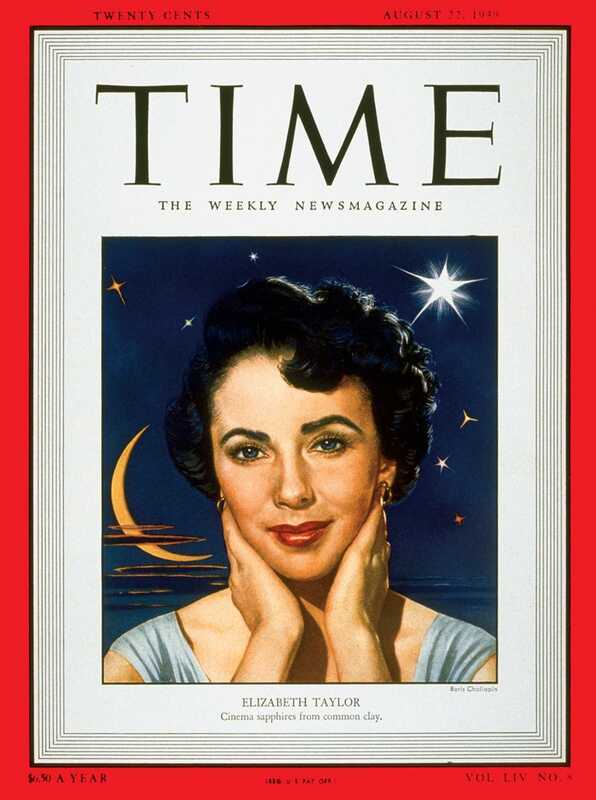 At 17, 5 ft. 4½ in., 112 Ibs., Elizabeth Taylor is a great beauty. She is a perfect type of the Black Irish. She has heavy black hair and brows that are also black and thick, but not a whit too thick to frame her large, luxuriantly lashed blue eyes, which darken into violet in the least shadow. Her complexion has been described by an ecstatic publicity man as "a bowl of cream with a rose floating in it." Cameramen have paid her Hollywood's ultimate compliment to beauty: "She doesn't have a bad angle." Elizabeth's womanly beauty usually makes strangers forget that she is, after all, only a youngster, but her behavior quickly reminds them of it. Beneath her breath-taking façade there is scarcely a symptom of sophistication. But Elizabeth, for all her youngish ways, is a purposeful girl in a way that Hollywood admires: she is feverishly ambitious to make a success in pictures. Mother is paid to watch things closely. To fortify her natural inclinations to protect her child, M-G-M pays Sara Taylor $250 a month (the usual fee for "movie mothers") to guard its property, which one M-G-Magnate has spaciously valued at "$50,000,000, maybe even $100,000,000." Elizabeth herself makes only $1,000 a week, which is raisins to the plums she should soon be getting. Next year her salary goes up to $1,500 under the present contract, which has three years to run. Bonuses may add to her take. When Elizabeth talks about her future in the movies, her eyes flash sapphire sparks. "What I'd really like to play," she gasps excitedly, "is a monster-a hellion." MGM's Billy Grady thinks she has the temperament as well as the beauty to become a great star-"And when she begins to show it-Oh, Brother!" This post is excerpted from Time.com. Republished with permission. The full piece is available here.